A new paper that is based on the PhD work of Valentine Seymour is out. Valentine has been researching the patterns of volunteering in environmental projects at the organisation The Conservation Volunteers. In the paper, we draw parallels between the activities of environmental volunteers and citizen science participants. The analysis demonstrates that the patterns of participation are similar. Environmental volunteering and environmental citizen science projects both have a pivotal role in civic participation. However, one of the common challenges is recruiting and retaining an adequate level of participant engagement to ensure the sustainability of these projects. Thus, understanding patterns of participation is fundamental to both types of projects. 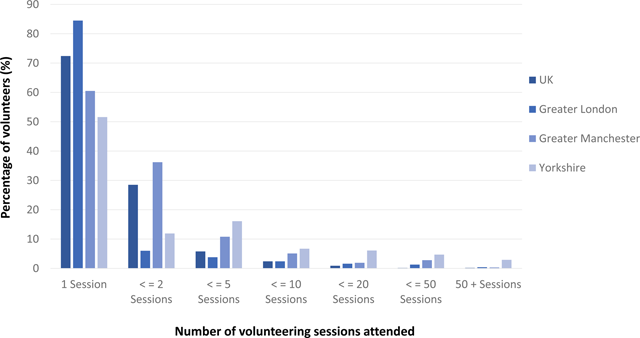 This study uses and builds on existing quantitative approaches used to characterise the nature of volunteer engagement in online citizen science projects, to see whether similar participatory patterns exist in offline environmental volunteering projects. The study uses activity records of environmental volunteers from a UK environmental charity “The Conservation Volunteers,” and focuses on three characteristics linked to engagement: longevity, frequency, and distance travelled. Findings show differences in engagement patterns and contributor activity between the three UK regions of Greater London, Greater Manchester, and Yorkshire. Cluster analysis revealed three main types of volunteer engagement profiles which are similar in scale across all regions, namely participants can be grouped into “One-Session,” “Short-Term,” and “Long-Term” volunteer. Of these, the “One-Session” volunteer accounted for the largest group of volunteers.